Two University of Oklahoma students have been expelled after a video was leaked of them leading a racist fraternity chant, and some students say OU's entire Greek system may be to blame for racism at the school. 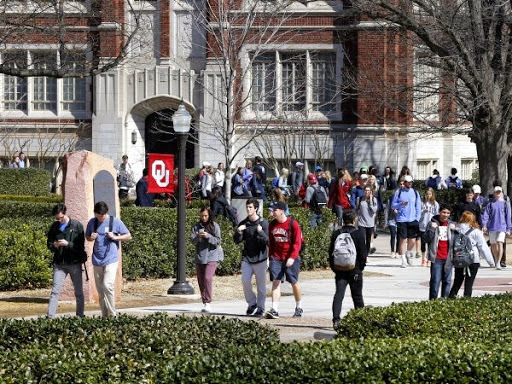 "It's too segregated," Markeshia Lyon, a junior at Oklahoma, told the Associated Press, referring to the school's Greek system. "That's something that's passed down, and that's something that needs to change." In the video, SAE fraternity members were caught using racial epithets and chanting about lynchings, while boasting that black members would never be admitted into the fraternity. OU President David Boren responded swiftly following the emergence of the video, expelling the two students for their participation in the racist chants, and citing their contribution to "a hostile learning environment for others." Some students told the AP that racism is common at OU, where only 5% of students are black or African-American. Some students blame the school's largely segregated fraternities and sororities. Lyon told the AP of an incident during her freshman year where she, and other African-American classmates, tried to go to a fraternity party and were turned away because of their race. She noted that it was deeply hurtful, but not uncommon at the school. A man who claims to be the last black SAE member at OU has spoken out about the pain caused from watching that video. William Bruce James II pledged SAE in 2001, and is highly disturbed by the content on the video. "I feel like I've lost a family member," James said, speaking to Oklahoma news station KFOR. "That pure bond of brotherhood, I don't know if I'll ever get that back."